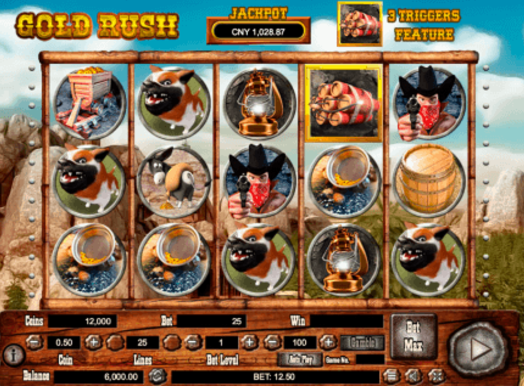 Prospect your way all the way to the West Coast in search of new lives and fortunes when you play gold rush the new slots uk online prospecting adventure game. Navigate your way across the Oregon Trail and transform your mine into a booming destination for gold extraction. Match symbols of pickaxes, prospectors and cunning mutineers to pick your way all the way to the top and prospect your weight in gold. The developers at Playson are always looking for new ways to entertain and satisfy their players, whether that be through unique themes, fun features or higher chances of winning. Variety and quality are their priorities, therefore offering anyone a slot experience to their taste and making players return to their portfolio, looking for more. Gold Rush takes you down the gold mines, where the treasure is hidden literally everywhere, but instead of using physical force to find it, all you have to do it press the spin button. You can discover more about Playson's range of online games at easy slots. In the gold mines lurks a world of darkness, moles and hard work. But underneath all that lies a golden light unlike anything you’ve seen before and you can start digging to become richer than you ever could’ve imagined. There are miners, TNT and Bonuses to help you, so the quest isn’t so dreadful. Once you come back out to the surface, everything will seem golden to you. This slot game has 5 reels and 9 winning bet lines hidden beneath the surface. It is here that you’ll be spending your time in Gold Rush. The top-quality graphics create a complete, though cartoonish, experience that you’ll be able to enjoy. Besides the regular spins, there are quick spins available for those players that cannot wait to find their treasure, or auto-spins, which will actually leave you without any worries, just watching as the prizes pour in. You can bet a minimum of 0.27 credits and a maximum of 45.00 credits. Even underground, there are many features to look forward to and explore, maximizing your winnings. The symbols include a fearless miner, a sneaky mole and a trapped bird, and spinning 3 or more of any matching symbols will reward you with prizes. The Wild Card of Gold Rush is the TNT detonator symbol, which expands on the whole reel, substitutes any other symbol and increases the free spins bonus prize by 1.35x. The TNT symbol rewards you with one dynamite stick whenever it lands on the reels, and once you collect 10 of them, a Bonus Game is triggered. Then, you are taken to the deep underground, where you have to choose one of the 3 mines. If you find silver, you are given 30% of the Bonus Prize, if you find gold, you are given 60% of the Bonus prize and if you find gemstones, you are lucky enough to win 100% of the Bonus prize. Moreover, there is another Bonus Game to try. When the Waggon symbol appears anywhere on the reels, the Click-me Bonus game is triggered. Then, you can choose one of the waggons you are presented with, and win one of the following: 4x your total bet if you find silver, 7x your total bet if you find gold, or 12x your total bet if you find gemstones. Sounds like a good time to start digging! Don't miss to join & spin today. 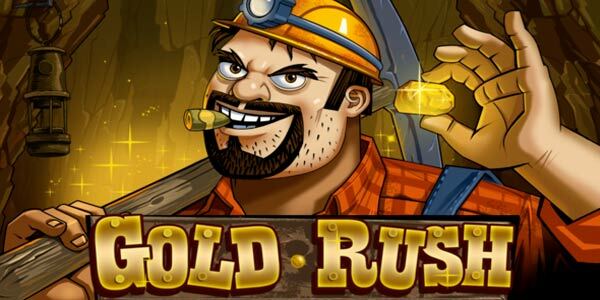 Gold Rush is an entertaining slots experience with playful features you can explore while digging for gold, gems and silver. No matter which you find, you’re sure to come back up a bit richer. 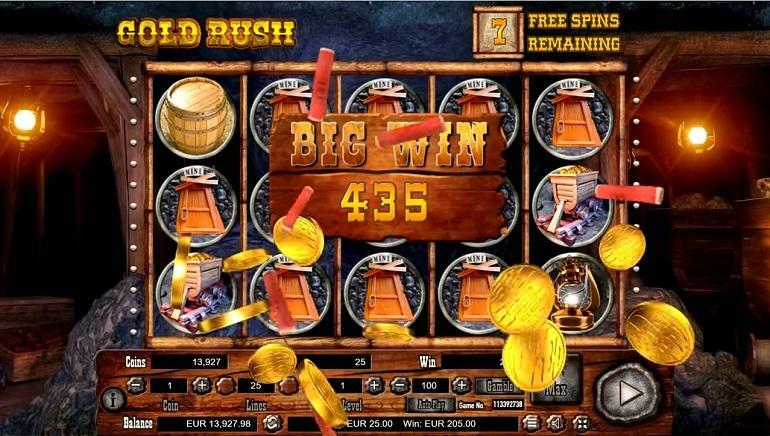 If you enjoyed Gold Rush you might also like to visit EasySlots.com to play other popular online slots.